First up are reviews of a couple books I've read in recent months, Wild Bill Donovan: The Spymaster Who Created the OSS and Modern American Espionage by Douglas Waller and Truman by David McCullough. As the title explicitly explains to the uninitiated, William Joseph “Wild Bill” Donovan was the founder of the OSS, the spy agency that was founded during World War II, later to morph into the CIA during the Cold War. A Medal of Honor winner in the First World War, Donovan was a scrappy, self-made man with street smarts (as a Catholic, he was initially an “outsider”), who was also ambitious and restless. Though he was a lawyer by profession and a partner in an affluent law firm, he used his position as an opportunity to engage in international travel and intrigue, often volunteering (whether welcome or not) to size up and gather intelligence on the people he met and the places he visited. (As an indication of both his prominence and resourcefulness, during a trip overseas before the war he wrangled a private meeting with Italy’s Benito Mussolini and smooth-talked him into having his military staff provide him with tours and briefings of Italy’s military and political goals, capabilities and operations.) Donovan's activities convinced him of the importance of intelligence gathering and, after persistent prodding, he convinced President Franklin Roosevelt—who was a bit of a spy buff himself—to create and appoint him head of what became the OSS. Though each man came from rival political parties, both knew the value of information. The book reveals the agency in its infancy to be often amateurish and slapdash, predictably attracting wannabes who sometimes had more chutzpah than common sense. This was partly a reflection of Donovan’s own personality and his predilection to abruptly jump from one interest to another. Furthermore, none of this should be a surprise since, up until then, the U.S., didn’t have much of a tradition in spycraft, particularly compared to Great Britain, which had a hand in the founding of the OSS. Indeed, the British played a key role in pushing Donovan to found the agency and providing him with assistance in building it; Donovan early on recognized that war was coming and strongly supported the British, so they saw him as a friend and a key contact within Roosevelt’s inner circle (though they probably misread the degree of influence he actually had with the president). While Donovan was occasionally criticized for being too dependent on the British—or, worse, being nothing but their puppet—to his credit he did become wary of his relationship with them and, once the OSS found its legs, he certainly marched to his own drummer, often operating at odds with his British counterparts in different theaters of operation around the world. Contrary to the more under-the-radar approach of the British, he OSS’s operations and ambitions were certainly as much a reflection of Donovan’s outsized cowboy personality as his desire to ensure the OSS made its mark. Not surprisingly, Donovan seemed to spend as much time fighting political battles in Washington as he did fifth columnists and Axis enemies. This was in large part due to FDR’s style: the president liked to play people and agencies against each other and fancied the OSS as his own private spy agency (he initially funded it in secret without Congress’s knowledge), with little thought or planning devoted to how its work fit in with similar operations within the military, the FBI and various other U.S. information agencies. (Not unexpectedly in retrospect, Hoover despised Donovan and worked hard to discredit both the OSS and Donovan himself.) Working at cross-purposes and stepping on other agencies’ turfs were not uncommon occurrences. The book also sheds light on many of the side clashes and political maneuverings that went on during the war outside of the better known theaters of operations in Europe and the Pacific. In some ways, the OSS’s activities were particularly important in these areas in the absence of an overt American military presence. Places like Switzerland and Turkey were hotbeds of espionage—not too unlike the kind of intrigue romanticized in the film Casablanca—where many spies’ identities were widely known and informants switched sides on a dime (or, rather, for a dime). Other hotspots in the Mediterranean, the Middle East and especially Eastern Europe also provided openings for opportunists, nationalists and political factions to settle scores, engage in criminal acts and/or assert sovereignty, often playing Ally advisors and agents against their Axis counterparts. In these instances, the U.S. and the British often parted ways and clashed, partly because the British were more engaged in realpolitik and focused on preserving the British Empire while finding the morality that often drove American policy as idealistic if not downright disingenuous and delusional. Though the value of Donovan’s work—or at least the OSS’s—came to be appreciated within the U.S. government by the end of the war (even within the military), after the death of FDR, the agency’s future became uncertain. FDR’s successor, Harry Truman, eventually came to see the value of an intelligence agency as the Cold War emerged, but had no trust or confidence in Donovan, despite Donovan’s best efforts to gain it. Eventually, Donovan was squeezed out and the CIA was founded. Some of the men who worked under Donovan (not all happily) would work for the new agency. A few—most notably Allen Dulles—would even go on to serve as CIA director. After his work with the OSS wound down, Donovan remained active but restless: he helped prosecute war crimes in Nuremburg (though he eventually had a falling out with the lead prosecutor) and briefly served as ambassador to Thailand (where he tried to re-engage in spy activity). It’s clear, however, that Donovan spent much of his remaining years trying to recapture the excitement and influence he had achieved with the OSS during the war. But though his service was honored and appreciated, the world had changed. Nevertheless, the passing of time showed that many of his innovations and ideas about the importance and work of intelligence to be prescient and valuable. So while the establishment of the CIA was intended to signal a clean break from the OSS and the start of a more professionalized intelligence service, credit must still be given to Donovan for laying down the groundwork for the modern CIA. 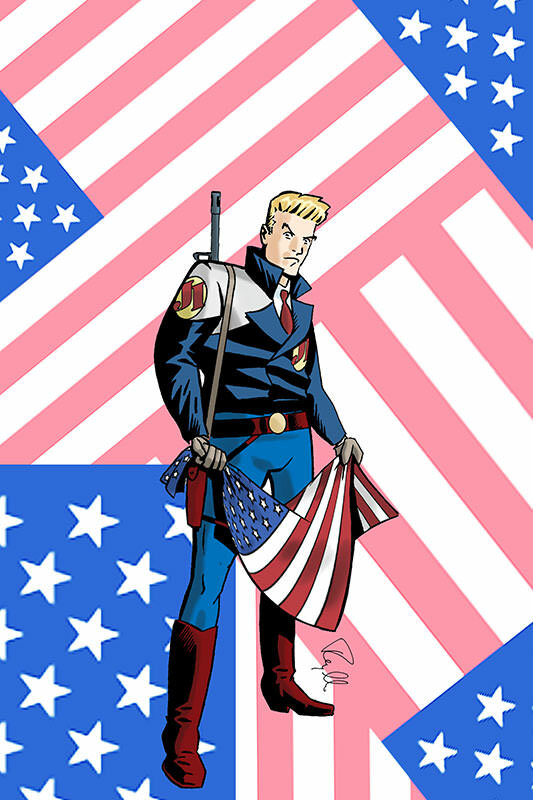 After its successful debut at the 2012 San Diego Comic-Con, Rob Hanes Adventures #13 is now available! Visit the WCG Comics website to order online now! The issue features two complete adventures: In "Crime Takes a Holiday," Rob vacations at the French Riviera, while in "Not Your Father's Private Eye," Rob becomes the subject of a news magazine article while on assignment. "Middle East Strongman Hastens Own Exit," a breaking news story covering an incident portrayed in the issue. 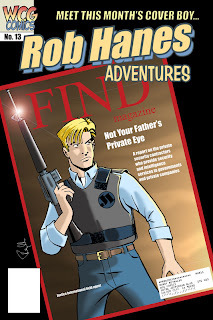 Both stories are the full-length versions of articles found in Rob Hanes Adventures #13! Readers will also be excited to know that issue 14 is now also in the works: picking up on where issue 13 leaves off, Rob becomes involved in the "Arab spring" sweeping through the Middle East country of Koman when he is hired by the nation's exiled princess to accompany her into the middle of the conflict so that she may re-connect with a former lover who also happens to be head of the uprising.